Doug Phillips has resigned as president of Vision Forum following his announcement of a moral failure, which according to his resignation letter, involved an "inappropriate relationship with a woman." Phillips has long been the face of a particular branch of Reformed Christianity which models very rigid family structures (led by the "Federal Head," the husband), promotes the Quiverfull lifestyle, enforces strictly supervised courtship dating for youth, and also teaches a form of Dominionism (got to have lots of babies, you see, through embracing the "quiverfull" teachings, if you're going to have any shot at taking Dominion of the world). 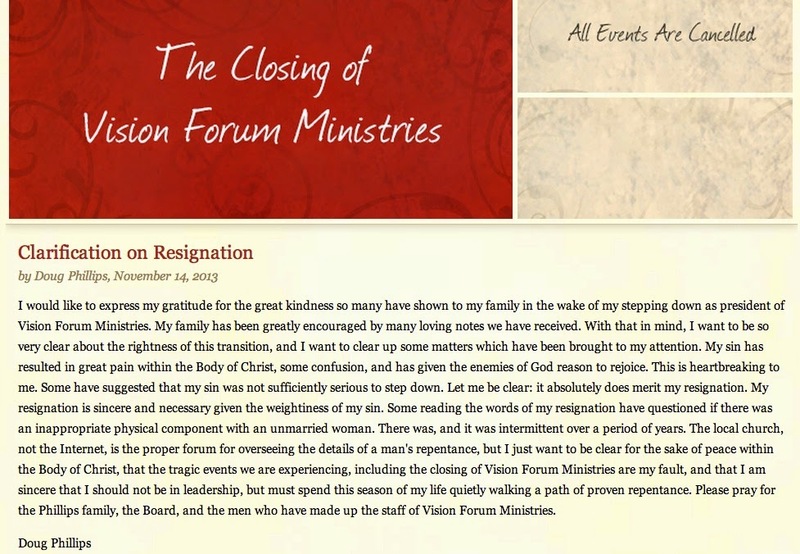 I have personally counseled several women who have come out of this movement, and who didn't quite fit the mold for whatever reason, and whose experiences with Vision Forum leadership ranged from neglect to outright spiritual abuse. I've also wondered at times, why the Vision Forum form of Dominionism seems to fly under the radar, as opposed to the New Apostolic Reformation (NAR) form of Dominionism. Probably because the NAR is so easily dismissed, with its angel feathers and gold dust silliness, while the Vision Forum crew are so theologically buttoned up as to seem to earn them a pass. 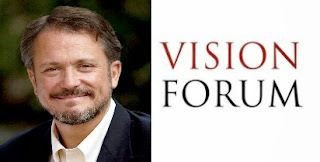 While I have long disagreed, oftentimes publicly, with many of the Vision Forum views, I have compassion in general for the body of Christ, including those who have been influenced by Vision Forum, Dominionism or Quiverfull legalism. 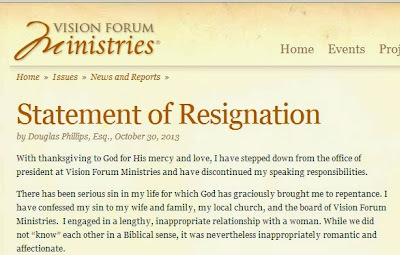 Sadly, so many in Christendom seem to swarm from one big leader to the next, from one hot new book to the next, and now, those in the Vision Forum movement are witnessing the fall of one of the most high profile leaders in the Reformed camp. But Quiverfull legalism and hyper-separationism are no insulation against sin, which is the great leveler of us all. May we all be sobered by this latest scandal, and cleave to our Lord and Savior all the more. I am sorry for these circumstance for Doug Phillips, and will be praying for him. 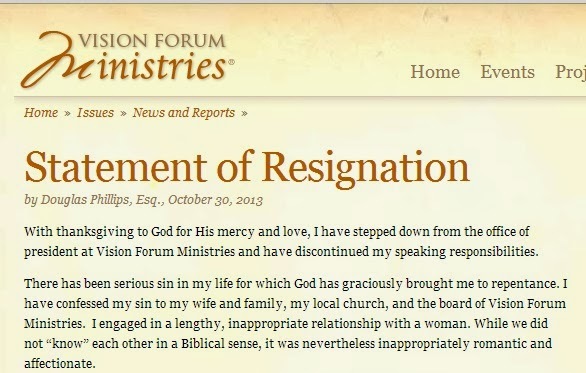 The original Statement of Resignation can be read here, along with the Clarification Statement which confirmed that there was a physical component to the "relationship."